The Mexican blackberry season is now starting, and while the demand for this fruit remains stable, without many ups and downs, the company Harvest 52 has been trying for a few years to gain them popularity worldwide, and has plans to open new markets. Blackberries are the most important product for Harvest 52, but it also grows and exports strawberries, blueberries and a small volume of raspberries. "This season, we expect 3 million kilos of blackberries, about 1.5 million kilos of strawberries and 300,000 kilos of blueberries," explains Kristhine Hoflack, sales manager at Harvest 52. 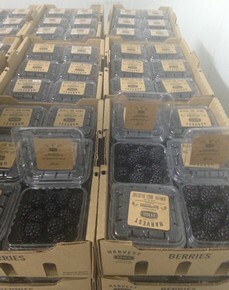 "We are the first company to start the blackberry season in Mexico. We begin in mid-August and finish in late June. We have a stable production, so we can supply our customers almost all year round," she continues. The company exports its products to many markets around the world, and Hoflack assures us that it has no limits. "Most of our shipments obviously go to the United States, but we also export to countries like Russia, Dubai, Spain, the United Kingdom, Japan and the Netherlands, and we plan to open new markets." The company intends to start exporting to more destinations in Europe and also China. To export to this country, it is necessary to have a special authorization from the Mexican and Chinese governments, which Hoflack assures us they are about to obtain. "We've been working on it and it is one of the markets we will be opening this season," she states. The exporter admits that there is plenty of competition from other Mexican companies, but almost everyone knows one another and they are not perceived as a danger. "We just offer a type of service and quality that ensures our success, and I think the market is pretty good overall." Prospects for the new season include increasing the volume of shipments and the number of customers, while continuing to improve every season. To this end, they will attend the Worldfood Moscow fair, where they hope to attract new trustworthy customers with whom they hope to forge long-term relationships. Although it is still raining lightly, the harvest has not been severely affected. "Our quality improves every day. We conduct three quality inspections before shipping the products and export only the best fruits. We prefer to wait a week instead of supplying a lower quality fruit. We work hard to be able to offer the best quality in the market." Harvest 52 was founded three and a half years ago in Colima, Mexico. "We are producers and exporters. We have our own fields and also export fruit from other associated producers," concludes Hoflack. The company supplies premium quality berries and has the GlobalGAP and Tesco certifications, with plans to obtain two other certifications in the near future. Harvest 52 will be attending the Worldfood Moscow fair next week. You can find them in Hall 2, stand D125.